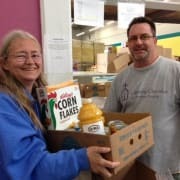 Volunteers help feed the hungry in our community. There are many opportunities on the front desk and in the warehouse to assist Catholic Charities distribute food to over 15,000 individuals per month. We are open Monday - Friday from 9:00 -4:00 and can tailor a volunteer schedule to fit your work and school life.